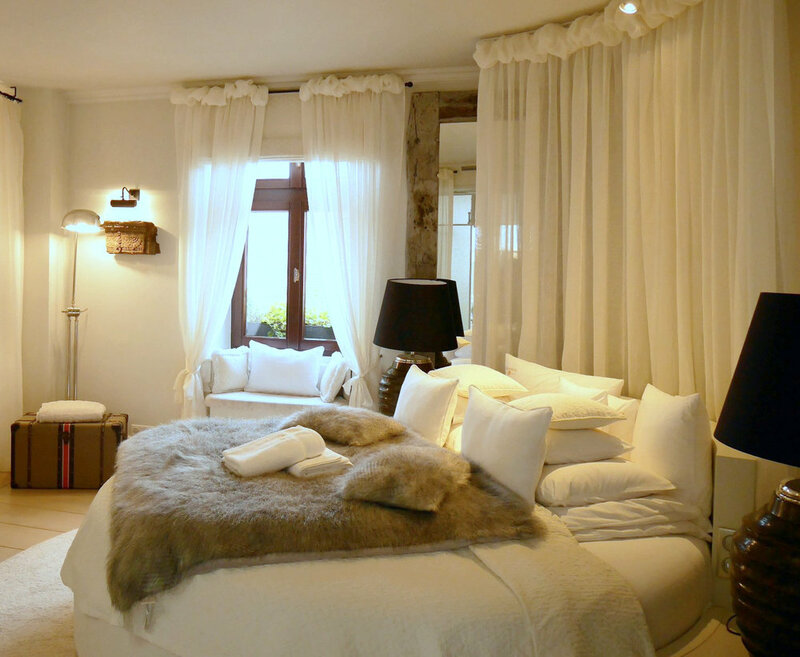 Kanonicza 22 is an exceptionally small boutique hotel set above one of Kraków’s best restaurants. The historic building is situated on a quiet street in Old Town and is just steps from Wawel Castle. There are only three apartments, each taking up an entire floor. All three are equally exclusive and opulent yet incredibly comfortable and serene, but all of them have their own unique style and personality. We stayed on the very top floor in the imperial suite. From the moment we stepped through the doors we felt extremely comfortable. The room is divided into two sections- when you enter you’re in the living/dining area which also has a desk setup as well as a large closet. This area also has a set of stairs that leads to the rooftop (more about that later). The other half of the large space is the bedroom and bar area. There are curtains to divide the room if needed. The bed was one of our favourite parts of the room. Housing a circular and oh so comfy mattress, the bed is made with luxury sheets and linens and topped with a cozy fur blanket- the entire setup was utterly divine. The bar area included coffee, tea and spirits, and also had a well stocked fridge. The adjacent bathroom equally matches the opulence of the rest of the apartment. We wanted to pick it up and take it home with us. With two matching sinks as well as a standalone tub and large separate shower, the room was completely surrounded in mirrors which made the already spacy bathroom feel very large and roomy. Lastly there is the beautiful rooftop with views of the Wawel Castle. 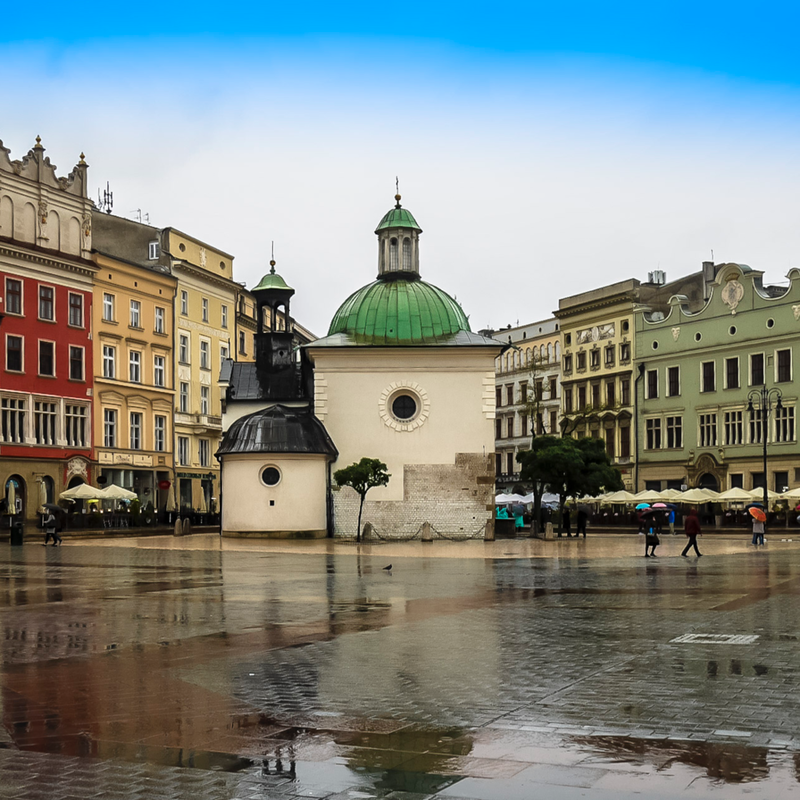 It unfortunately rained the entire time we were in Kraków, so we didn’t get to take advantage of it. The roof is normally covered by a retractable door to keep it dry, but there is an easy to use control panel at the bottom of the stairs. Up on the roof you’ll find loungers as well as a very large hot tub. We were so disappointed to not be able to use it! During our time there we also got the opportunity to view the other two, equally luxurious suites. All of very distinct styles. If you’re staying here, have fun choosing which one you’d prefer for your stay! Each morning, you’ll be spoiled with a delicious and vast breakfast in the restaurant. However, you shouldn’t pass up the opportunity to eat another meal here either. They have a fantastic wine list (make sure to explore their wine cellar collection), and the delicious menu features traditional polish food done with their own unique twist. The restaurant takes up two floors, including the basement. The lower level features a private dining room as well as the wine cellar where they also make their own spirits. Lastly, you’re probably wondering who stays here! Celebrities including Benedict Cumberbatch call it home while visiting Kraków. 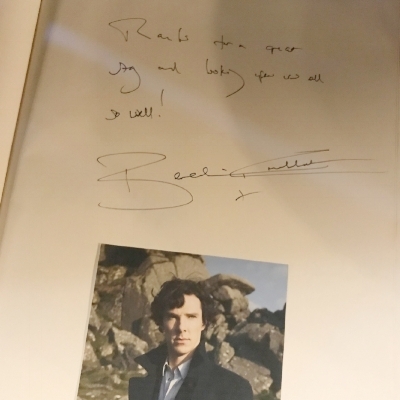 Benedict Cumberbatch's in the guestbook. But Kanonicza 22 is for those with discerning tastes who want and can afford the best, it certainly won’t disappoint! This stay was truly a highlight and a treat for us! Rates from $450 CDN/night (Approx 300 €/night). *This post is in partnership with Kanonicza 22, however, all opinions are our own. All Photos by us, follow us on Instagram.